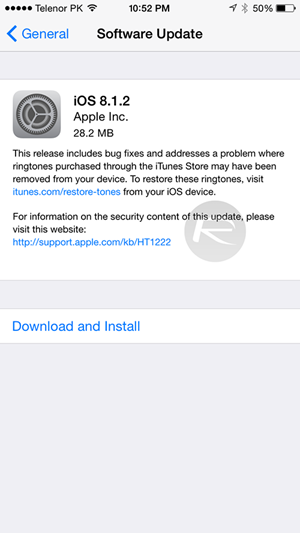 iOS 8.1.2 download is out! Apple has rolled out iOS 8.1.2 both as OTA and direct download via iTunes for supported iPhone, iPad and iPod touch devices. Changelog along with other details are as follows. 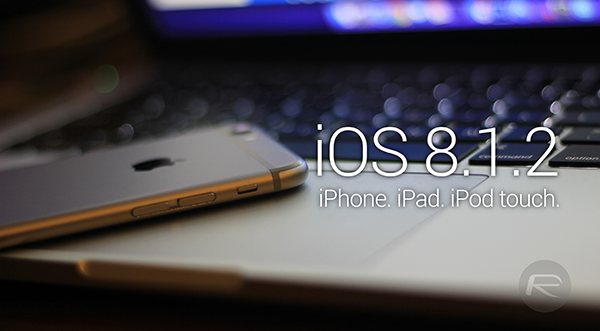 Even though iOS 8 is only two-and-a-bit months old, it has already seen a number of updates. The first, iOS 8.0.1, was a bit of a mess, leaving thousands of iPhone 6 users with the dreaded No Service warning in the top-left of the display along with a non-functional Touch ID. iOS 8.0.2 followed shortly after, and iOS 8.1 then introduced Apple Pay. iOS 8.1.1 arrived with a number of security fixes, and for the most part, reports suggested that Apple was squarely focused on testing and preparing iOS 8.2. But when little bugs arise that simply cannot wait — iOS 8.2 isn’t expected to manifest itself until the new year — Apple tends to roll out small updates to fix lingering issues, as has once again been proved with the impromptu release of iOS 8.1.2. The small update notably addresses an issue with iTunes Store-purchased ringtones disappearing from devices. But this, alone, isn’t too critical, and it would ordinarily take a little more than this to have Apple scrambling to make updates. Thus, among the spate of "bug fixes" mentioned in the change log, we’d hazard that some work has been done to amend security holes within the iOS software, although given that iOS 8.1.2 is hot off the press, we’ve yet to learn precisely what Apple has or hasn’t fixed. With iOS 8.2 well into its beta, that will be the next major software update to Apple’s mobile platform, although with Apple making a habit of dropping these go-between updates, we might be up to iOS 8.1.3 or even later on in the version count before the significant bump hits the download channels. I updated my iphone and now my jailbreak is broken. I put all jihad on REDMOND pie. @ Achpoo I’m extremely confused why u would ever update knowing u are jailbroken and knowing the firmware u were currently on was jailbreakable. 1st sign of being an idiot – not one Dev mentioned anything about this 8.1.2 update (red flag) 2nd sign of being an idiot – this article specifically said it doesn’t even know what this update is even fixing….. (Red flag)… Final sign of being and idiot – With a new update also comes mobile substrate issues that Saurik would need to update as well (which he has not commented on this update either (red flag). 1st 2nd and 3rd idiotic moves equals a complete moron too and a douchebag for the next sentence.. With that being said, how would that be Redmondpie’s fault??? Also your jailbreak assuming u had a number of tweaks would need to be updated most likely. Your effin dumb for your actions, your words and most importantly, for pointing your finger at Redmondpie!!!!! I don’t think achpoo (gesundheit) actually upgraded with device. By the tone of his message, I would take it to be farce. My jailbreak no longer works WTF REDMOND PIE! Stop being an anti-muslim facist b****** achpoo, Muhammed, Jarred, Carl, whatever your loser troll name is. Derka derka, what the hell. My jihad app no longer works on 8.1.2. This not good for my underground activities. I want refund from the infidels. pl’s tell to me 8.1.2 is good or bad for I phone 5S ? Yeah, what about iPhone 6 PLUS ?? Is 8.1.2 safe ? I am staying with 8 and I won’t updated to 8.1.1 and now what about 8.1.2 ? Can I directly update from iOS 7 to iOS 8.1.2? yes you can… i upgraded mine. Iphone 5S. Jail break using TAiG yesterday and its working. This has been out for a while. Why is this being reposted? Can some one tell me which link i should download ? This article confusing me big time. Did it mean 8.1.3? It depends what carrier you have. My comment gets removed because I’m calling you guys out on reposting the same article? There’s no need for this. iOS 8.1.2 has been out for a while already. And I love reading RedmondPie but if you’re going to start censoring comments, go for the stupid spammers first, not actual readers. I don’t care for censorship and you guys are no different than the North Korean hackers if you think you’re going to be allowed to censor people’s opinions. Does Airplay now work properly? Video and audio? Akesh, if it has a slot to insert the SIM, you need the GSM link. If it does not have the SIM slot, you need the CDMA link. what to do :/ ? what does gsm and that mean i just have a regular iphone 5c… which one do i do??? When I’m about to update the ios 8.1.2, the software is update failed. How’s that? What am I going to do? iPhone 5c other than sprint use the gsm file. Verizon iPhone 5c comes with a SIM card and is unlocked. It should be forever but .ipsw files are very large because it hold all the software for iOS.